The cyber-coenobitic religious community for the 21st century - and now with added tealights! Where creation is respected; where the divine is encountered; where trees are sung to. Where no bunny goes un-hugged. Where Druids worship in the oak groves of Aspley Heath. Where mistletoe is cut with a gold-covered stainless steel sickle (pure gold is just too soft....) Where even thick places are thin. Just five miles from Milton Keynes, handy for the Midland Mainline (change at Bedford), the Bedford-Bletchley Line and M1 Junction 13. Or, for the more affluent eco-tourist, there's Cranfield Aerodrome. More traditional than Celtic Christianity (like that's hard...); more Arran Sweaters than the Highlands and Islands; more facial hair than a convention of Dubliners fans (and that's just the Archdruid). The origins of our community came out of discontent with the spurious nature of modern-day "Celtic Christianity". A movement that thinks the best way of recreating the environment in which hairy monks sailed across wild oceans, conducted three-hour services in Latin and were martyred for their faith when they weren't being flogged by the abbot for minor indisciplines - is for people to sing along to dreamy choruses while accompanied by badly-played guitars and flutes. 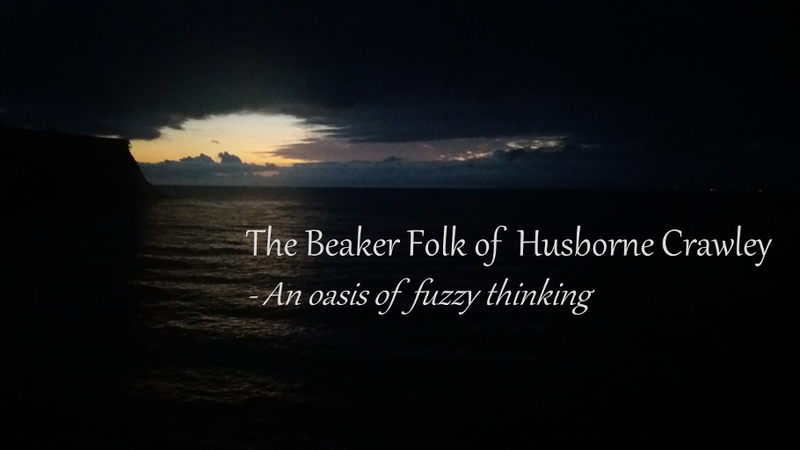 Here at the Beaker Folk of Husborne Crawley, we know that the search for spiritual fulfilment is one of the great quests of modern men and women. We wanted to find a better life; a more natural way of being; closer to the Earth and yet also closer to our own spirits. We found that pattern in a group of people who lived in this land more than 3,000 years ago, and yet are our own ancestors: the Beaker People. * They were earlier than the Celts, so they must have been even more exotic and spiritual. * So they must have had druids. * And the use of stones in worship. (We tend towards pebbles rather than 20 ton sarsen blocks. Easier to move). * We like the word "folk". Makes you feel all comfy and Arran-sweaterish. * They probably had tea lights. Obviously, not like our modern tea lights. Probably made of tallow and smelt disgusting, and they hadn’t discovered aluminium. But in an era before electricity, and without access to olive oil, they must have made use of some kind of tea light-related technology. * They were peaceful and gentle - except when massacring their neighbours to steal their wives and sheep. So welcome to the Beaker Folk of Husborne Crawley. A place where you can splash in the spiritual shallows without ever worrying about getting your moral feet wet. We welcome people of all faiths. And nuns. Archdruid Eileen: Archdruid of the Beaker Folk - rules with a rod of iron (and a Slazenger V400 Cricket Bat). Theologically more orthodox than she sounds, she has taken "all things to all people" to a whole new plane. Back from sabbatical and no more mellow. Hnaef: Eileen's very-nearly-loyal Executive Deputy Druid. Runs an archery school for people with no thumbs in his "day" job, thus qualifying as "NAPDLE" - "Not a Proper Druid Like Eileen". In charge of discipline and knitting. Daphne: Hnaef's wife. Explains women's rights to him whenever he fails to understand. Charlii: Assistant Archdruid and Eileen's daughter-in-law. Until Eileen's sabbatical, often to be found wearing a squirrel outfit, due to being an expert in Children's Work (a role that often befalls the trainee). Now the proud mum of Celestine. Burton Dasset: Obsessive accountant, beer-mat collector, train-spotter and Community Treasurer. Drayton Parslow: Fundamentalist Baptist pastor of the fellowship meeting in Bogwulf Chapel. Not a Beaker Person, but Eileen lets him stay in a cottage in the grounds because he'd perish in the wild. Has a terrifying wife, Marjorie. Believes in the headship of males because Marjorie tells him that's what God wants. Young Keith: Illegitimate son (it turns out) of Archdruid Eileen. Inclined to blow things up during "alternative worship". Terrifying experimental scientist. Fond of a pint at the White Horse. Married to Charlii. Edith Weston, Stacey Bushes, Aelfried, Aelwine, Burleigh, Morgoth etc: Beaker People of varying degrees. PC Ben Connolly: Young Keith's adoptive "uncle". Keeps the peace, and keeps the Beaker People out of trouble. WodeWose: Ancient mythical being who lives in the woods and muses on life with a group of talking rabbits and squirrels. Piper at the Gates of Dawn: aka Herne the Hunter, Pan. Degenerate nature god who turns up an hour late at summer festivities due to not understanding British Summer Time. Squonk: Mythical American folk-creature who is incurably ugly. Crying due to its ugliness, it is easy to follow due to the trail of tears it leaves. If you capture it, will dissolve into a puddle of tears. Two obvious 70s prog rock references there. Or maybe I am seeing things too obviously and directly. Perhaps I need to turn the ambient music up, restart my sacramental waterfall and light some tealights and repeat over and over 'I must look for the underlying meaning and metaphor' an undefined and fuzzy number of times. It could only be the two. We've capped-off the Fountain of Salmacis due to the unfortunate effects on the menfolk. Just discovered your site,feel all warm and fuzzy now. Brilliant liturgy, which, no doubt about it, the church will be quick to adopt. I'm going to change my Twitter handle to @WodeWose. Slazenger cricket bats are very expensive. One sold on eBay for sixteen pounds. Has it been well knocked in? references to Genesis have to be very biblical? still looking for the book of Pink Floyd - must be in the minor prophets somewhere - oh ans surely there is some giant hogweed to be found in husborne crawley just to keep up the theme? point of order. Aran sweaters are from the Aran Isles of the West Coast of Ireland. The Isle of Arran (two r's) in the Firth of Clyde off the West Coast of Scotland does have shops where you can buy woolly sweaters (it is Scotland, after all) but they aren't specially known for it.